If you are looking for the best torpedo heater there are a number of things you may want to consider before you think about purchasing. Because you want to end up with the unit that’s most convenient and appropriate for your needs. The type of fuel, the power of the unit and its features are some of the important factors when purchasing a torpedo heater. Below we have put all the information together in one place in our comprehensive guide where we run through the types of fuels, the pros and cons, how much power you might need in your unit (BTU’s) and more. This is a great unit for smaller spaces. It carries important safety features along with a very useful runtime gauge. We like the fact this highly rated heater comes with variable output, giving you more control over heat output than other heaters. It can last up to 14 hours on a 20lb tank and comes with important safety features. If you need to heat up LARGE areas, then we think the MR Heater 175,000 BTU heater is a good option. It has an adjustable thermostat for temperature control and and important safety features. It is easily portable with oversized tires and has no flame. If you are wanting heavy duty, this is one of the largest output torpedos around heating up to 7,000 sq ft. It has all important safety features an an adjustable thermostat. In this section we cover the basics of what a torpedo heater is and how they work for those that are not familiar with them. Torpedo heaters are a great solution for heater outside areas such as sports events, worksites, and well-ventilated garages. They are portable and have a large range of heat outputs to suit any size or heating requirements. Along with that, there is a range of fuel sources for powering them. The beauty with these fans is that they are portable. There are a number of ways they are fueled including propane, kerosene, diesel, natural gas, multi-fuel or electric. 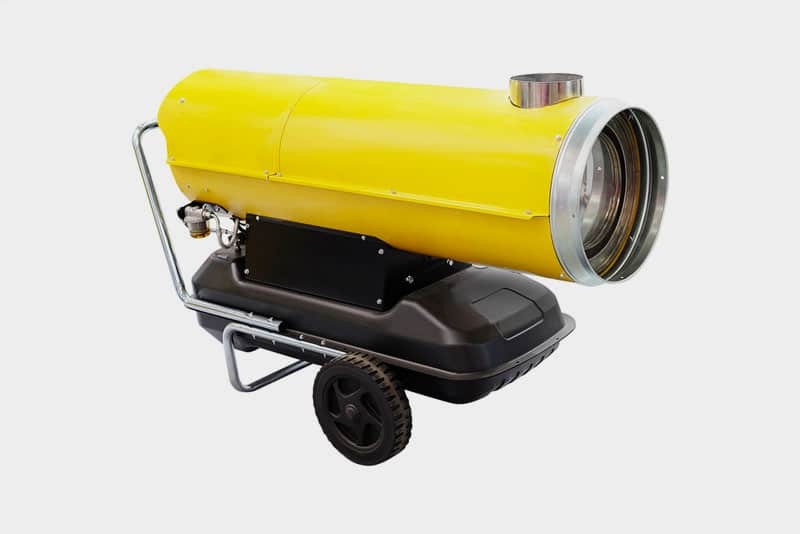 The torpedo heater is generally used in areas with good ventilation, often at construction sites, warehouses, workshops, and sporting events amongst others. Though they have been around since the 1915’s they became more popular in the 1950s when Scheu Manufacturing Company developed the modern Salamander heater to provide warmth on construction sites, enabling workers to work in the cooler weather. Inside the torpedo heater, there is a burner which, when the fan is turned on is ignited. A Torpedo heater works much the same way as a forced air heater for your home in that warm air is created and pushed out via a fan. There are a few different types of fuel used to ignite the burner, which each have their pros and cons. The fuel is gravity fed into the burner which creates the heat inside the unit. The following video gives some good insight into how a torpedo heater works. One of the most common types of torpedo or salamander heaters is one that is fueled by Kerosene. So if you plan to purchase a kerosene heater, pay particular attention to that. The benefits of using Kerosene as a fuel is that Kerosene releases more energy than propane and therefore creates more heat. So, in essence, you are getting more bang for your buck with kerosene than propane. It does, however, have a strong smell. Along with that when burned it produces carbon monoxide so you have to be sure to use a kerosene heater where there is adequate ventilation (outside). Obviously, it is not an environmentally friendly option. 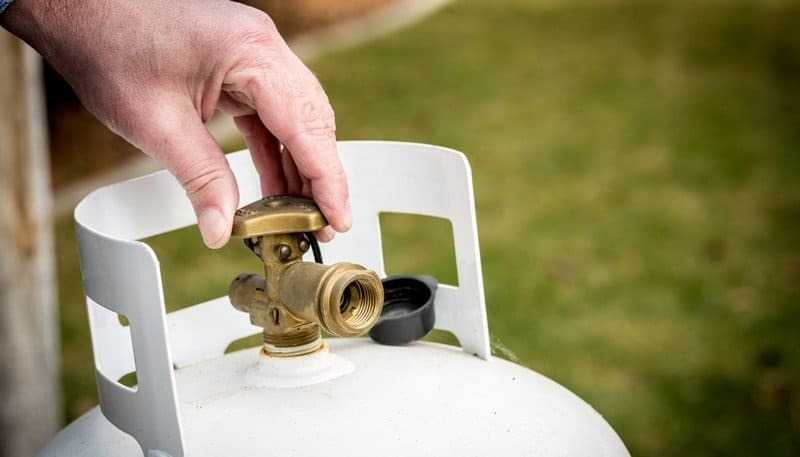 Kerosene is a little bit more difficult to purchase than propane gas given propane is commonly used for gas and BBQ cookers, so is stored by many services, grocery, and convenience stores. If you plan to stockpile your fuel Kerosene can be a good option. Below we have researched and detailed what we think are the best kerosene torpedo heaters. Note that many of these brands have the same torpedo heaters but in smaller or larger models so if you don’t see the size you are after here be sure to browse further as most likely there will be a model to cater for your requirements. Our choice for a larger kerosene heater. Also comes in a 210,000 model. Has a solid 10 hours of usage on a full tank and has good safety features such as an overheat switch. IS also CSA rated. Another form of fueling for torpedo, or salamander heaters is propane. Propane (also know as LP Gas or LPG) is a by-product of natural gas and is used most commonly for fueling gas bbqs. The good thing about propane is that it is much more environmentally friendly than kerosene producing minimal emissions. 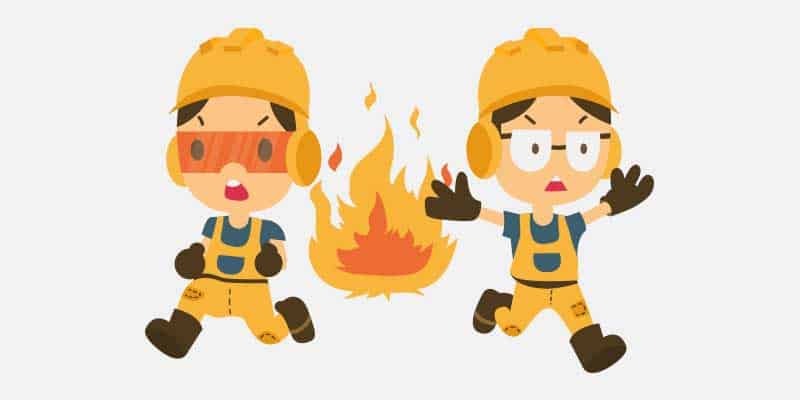 Funnily enough, propane is odorless and colorless and a chemical compound is added to it to help people recognize any leaks which may become a hazard. Obviously, propane is highly combustible and is not safe for inhalation. A diesel torpedo heater is one of a few options if you are searching for a larger forced-air heater. With a diesel heater, fuel is readily available and easy to access, the efficiency is high and the fuel source has fewer safety issues than some other torpedo heater fuel sources. The beauty is you are able to purchase multi fuel torpedo heaters which include diesel as a fuel source. These are great for versatility. However, you will need to be aware of some of the cons that come with diesel fuel such as storage of fuel and the cost compared to other fuel sources. Diesel-fueled torpedo heaters are commonly used for two good reasons. 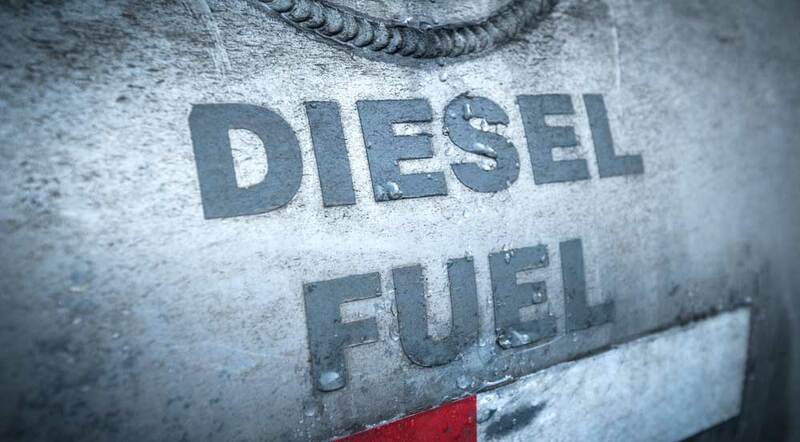 As a fuel source, diesel is cheaper and more accessible than both kerosene and propane gases. As with any other heater, when using a diesel-fueled unit you must be aware of the dangers of the gas. These units should only be used in spaces with proper ventilation to prevent the gas from building up to the point of posing a threat to our health. Diesel produces a fair amount of energy so you will be getting quite good results for the money you put in. A diesel forced air heater is capable of heating up large spaces in general, while the specific number of square feet the unit can heat up depends on the type of the heater and the manufacturer. As long as space has a proper ventilation, diesel is a great fuel choice for a torpedo heater. There are dedicated diesel torpedo heaters available however these days new models of torpedo heaters actually have multi-fuel capability, which means you can use many various fuels to power the heater. Many people ask whether you can use diesel in their kerosene heater and while this works on a technical level it is highly recommended you don’t for safety reasons. Diesel burns a lot dirtier than Kerosene so there are a lot more fumes and odor. These units burn the fuel efficiently and convert most of it into heat, meaning there is little to no loss of energy at all. It is important to know that diesel fuel will go off in sunlight so make sure the unit is always protected and don’t let the sunlight get to it unless the unit is made of a material that’s meant to stop the sunlight from affecting the fuel. You should be aware that fumes from this gas are hazardous to human health. Because the gas can build up and cause serious consequences, these units should not be used in enclosed spaces without good ventilation. Last but not least, diesel propane heaters can often create an unpleasant odor so keep that in mind when making your purchase. There are many new salamander heaters now that are able to run on multiple fuel sources. For example, this heater can run on Kerosene, 1 and 2 diesel fuel, 1 and 2 fuel oil and jp8/jet a fuel. This certainly makes things more convenient in regards to the aforementioned prices and availability of fuel. Below we have researched and detailed what we think are the best multi-fuel / diesel torpedo heaters. These multi fuel salamander heaters offer a bit more flexibility when it comes to fuel. If it is hard to find one particular source of fuel at any given time you have the option to use another. After reading thousands of reviews there were a few things that we thought would be worth sharing about torpedo heaters that are worth knowing BEFORE you buy. We run through these below along with what features you might expect to find on a torpedo heater. These are worth knowing as some of these features might be worth seeking out in some cases. Some of the common problems, issues or misconceptions of people who had brought a torpedo heater, but not been happy stem from the points below. Torpedo heaters are often quite noisy and by how much can vary a lot from model to model. It is also worth noting the more powerful the unit, the more noise it will make which adds another reason to be aware of how many BTU’s your torpedo might need to work for your in your space. Some torpedo heaters can be quite noisy. This has been a common gripe and some brands have recognized this and market some of their units as being much quieter than regular units. If the noise level is important to you, this is something to bear in mind. When purchasing a torpedo heater it is very important to understand the safety requirements – if neglected then there is a possibility of fatalities. Here is a good guide to using a torpedo heater safely. BTUs – What are BTU’s? BTU stands for ‘British Thermal Unit’ and is a measurement of energy. It is defined being the amount of heat required to raise the temperature of one pound of water by one degree Fahrenheit. Obviously, the higher the BTU’s of the heating unit, the more heat will be output. Some salamander heaters have a thermostat equipped so you are able to regulate the temperature of the area you are heating. If you are using the heater outside it will obviously not be much use, but for interior locations such as well vented warehouse, a thermostat could be a feature worth considering. Above we ran through the different types of fuel sources which can be used with torpedo heaters. The pros and cons of each with help you determine which kind of fuel is best for your situation. Safety consideration is hugely important with torpedo heaters as there are a lot of variables that ripe for danger. Manufacturers are required to meet certain levels of safety and below are some features manufacturers have built into their heaters. • Fuse protected the electrical system. At a minimum, you want to make sure the heater you are purchasing is CSA approved for the area you are using it (indoor or outdoor). A neat feature some heaters have is a runtime fuel gauge. This will enable to see how much time you have before your fuel runs out. This is great for planning ahead and ensuring you are always ready to refuel and avoid any cold stretches! Some torpedo heaters have a built-in mechanism which will allow you to adjust the unit up and down which will give you slightly more control over where your heat is going. Think about the size of the tank that you might want. Will you need to lift/move it by yourself? Do you need the biggest tank you can get? These are a couple of questions you might want to ask yourself when you are looking at the various models. This feature gives you more control over the temperate coming out of the heater. This is useful if you are wanting more than just one ‘speed’. Below we run through some of the most common questions asked about torpedo heaters. We also encourage any questions you might have so feel free to leave a question in the comment section. Can torpedo heaters be used indoors? It is recommended you don’t use a torpedo heater indoors. There are a number of things to take into consideration before you think about using a torpedo heater indoors. Firstly you want to check if the heater is indoor rated or outdoor rated. Using an outdoor heater indoors can lead to carbon monoxide poisoning. It is important to read the packaging and operating instructions. Wherever ever you use a torpedo heater, indoors or out, it must be used in an area with very good ventilation. Generally, torpedo heaters are far more than you need in a household but are commonly used in garages. What size torpedo heater do I need? I can still smell propane, is something wrong? Yes, you shouldn’t be able to smell propane after the first few uses if the heater is working correctly. Check your connections and make sure everything is tight. Can I use this torpedo heater to treat bed bugs? You should NOT use a torpedo heater to eliminate bed bugs. Torpedo heaters require proper ventilation or as a safety mechanism it will shut down. Along with that, heating a room to the temperature necessary to kill bed bugs poses a serious fire hazard and should only be attempted by professionals.